Satisfy your wings craving with our top picks. (SPOT.ph) First created in 1964 by the owner of Anchor Bar (known as the place that serves "the best wings in the world") in Buffalo, New York, this finger-lickin’ treat has become a favorite all over the world, including Manila. Often mistaken as deep fried spicy wings, authentic Buffalo wings are made with lots of butter and a nice balance of flavors with a distinct, non-overpowering tangy taste brought about by one of its key ingredients-vinegar. Often, it comes with a bleu cheese dip. 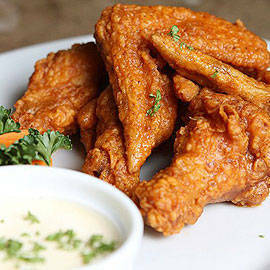 After feasting on tons of wings (some excellent and others so-so), SPOT.ph presents top picks for the best Buffalo wings in town. Tip: these are best eaten with bare hands, of course.